For other uses, see Disley (disambiguation). Disley is a village and civil parish in the unitary authority of Cheshire East, in Cheshire, England, on the edge of the Peak District in the Goyt Valley south of Stockport, close to the county boundary with Derbyshire at New Mills. The population at the 2011 Census was 4,294. To the north, the River Goyt and the Peak Forest Canal, which opened in 1800, pass along the edge of the village. Today it is a dormitory village retaining a semi-rural character. Disley railway station is on the Manchester to Buxton line, with through trains to Preston and Blackpool. The parish includes part of the neighbouring village of Newtown, the bulk of which is in Derbyshire. Its Anglo-Saxon name was Dystiglegh meaning wood or clearing by a mound or possibly "windy settlement". In the 13th century, in the time of Edward I, there are references to confirmatory grants of land made to Jordan de Dystelegh of Disley Hall and Roger de Stanley-de-Dystelegh of Stanley Hall in the district, pointing to even older local settlements. It later had the name Dystelegh. Sir Piers Legh of Lyme founded St Mary-the-Virgin Church in Disley (completed 1524) and consecrated as parish church in 1558. The earliest parish register is from 1591. The village had at least one cotton mill by the mid-19th century. As the cotton industry declined, more varied employment became the norm. In 2005, there is a paper mill and some light engineering works, but most people travel out to work. The parish of Disley was included in the 19th century as one of three parishes in Hayfield rural sanitary district, alongside Hayfield and Mellor in Derbyshire. In 1894, under the Local Government Act 1894, rural sanitary districts became rural districts, but were required to be entirely within one county or another – this led to Disley, the only Cheshire parish of the sanitary district, to form the Disley Rural District on its own – one of only a few single-parish rural districts to exist. This remained in existence until 1974, when it was merged into the new Borough of Macclesfield, whilst retaining a parish council. In April 2008 a referendum was announced for Disley residents because the Borough of Macclesfield was to become part of the new Cheshire East unitary authority as a result of major local government changes in Cheshire in April 2009. Some residents believed that the village would be better served if it were part of the neighbouring boroughs of Stockport in Greater Manchester or High Peak in Derbyshire. On 8 May 2008 this referendum was held, with an overwhelming result in favour of staying within Cheshire, with less than 1/3 of the electors wanting to become part of the Metropolitan Borough of Stockport and an even lower proportion of the population wishing the village to become part of Derbyshire's High Peak Borough. Macclesfield Borough Council was succeeded on 1 April 2009 by the new unitary authority of Cheshire East. Nearby Wyberslegh Hall (sometimes spelled Wybersley Hall), which stands between Disley and High Lane, was the birthplace of the Anglo-American novelist Christopher Isherwood. British historian A.J.P. Taylor bought a house in Higher Disley in 1935, for £525, so he could be close to University of Manchester when he was lecturing. Dylan Thomas visited Taylor, first staying for a month and drinking "on a monumental scale", and later returning, in the autumn of 1946, homeless and with his wife Caitlin, with Margaret Taylor allowing them to stay in the summerhouse in the garden. The playwright, critic, essayist and novelist Allan Monkhouse lived at the Grey Cottage on Jackson's Edge Road from 1893 to 1902, and then at Meadow Bank on the same road until his death in 1936. Lord John Hunt who led the first successful Mount Everest expedition in 1953 also lived in Disley. The director and writer Ian Clark was brought up in Disley and attended Disley Primary School. Big Brother contestant Anouska Golebiewski. Presenter of the BBC Bargain Hunt TV programme David Dickinson, who had his first antique shop there. 2008 Paralympics cycling gold medal-winning couple Sarah and Barney Storey. 2008 Olympics cycling gold medal winner Jamie Staff who moved to Disley for access to Manchester Velodrome. The "Rams Head" inn c.1650 at the centre of the village was formerly a lodge belonging to the Lyme Park estate. It became a main coaching stop on the Manchester to London route. The Rams head is now a restaurant and pub. Lyme Park is not located in the civil parish of Disley, but in the civil parish of Lyme Handley. However, it is sufficiently close to be associated with Disley. The hall was used by the BBC as a setting in its adaptation of Pride and Prejudice. Disley is home to Disley Cricket Club a member of the TACS Cheshire Cricket League, playing their home games at Disley Amalgamated Sports Club (DASC). The 1st XI play in the Division 1 having won the Division 2 championship in 2014 and Division 3 in 2013. Moorside Golf Club, Higher Disley (now defunct) first appeared in the 1930s. The club continued until the late 1950s. 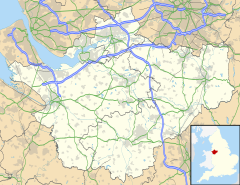 ^ a b "Borough of Macclesfield: Parish Clerks". Borough of Macclesfield. Archived from the original on 11 April 2008. Retrieved 21 April 2007. ^ The Ordnance Survey (2006). "Sheet OL1: The Peak District, Dark Peak area". Ordnance Survey Explorer Map: 1:25000 series. Southampton: Ordnance Survey. ISBN 0-319-23777-X. ^ "Disley". The Key To English Place Names. English Place Name Society. Archived from the original on 16 October 2015. Retrieved 9 May 2012. ^ "Manchester Evening News – News – Village Vote on Council Change". Manchester Evening News. 12 April 2008. Archived from the original on 5 May 2013. Retrieved 13 April 2008. ^ "Disley Parish Council – Declaration of Result of Poll". Disley Parish Council. 8 May 2008. Archived from the original (.doc) on 21 July 2011. Retrieved 24 May 2008. ^ Blue plaque on building reads: "Literary editor at the Manchester Guardian Allan Noble Monkhouse 1858–1936 lived at the Grey Cottage 1893–1902. Novelist and playwright of the "Manchester School" of drama." ^ "Clark family history". mandmclark.com. Retrieved 7 March 2017. ^ "Storeys add to GB cycling golds". BBC. 10 September 2008. Retrieved 29 October 2008. ^ "Awesome GB sprint team take gold". BBC. 15 August 2008. Retrieved 29 October 2008. ^ "Disley Cricket Club". www.disleycc.co.uk. Retrieved 8 August 2008. ^ “Moorside Golf Club”, "Golf's Missing Links". Wikimedia Commons has media related to Disley. "Disley Parish Council Website". Disley Parish Council. "Disley Football Club". Disley Football Club. Archived from the original on 12 February 2010. "Disley Cricket Club". Disley Cricket Club. "D&C Athletic Football Club". Disley Football Club. "Disley Baptist Church". Disley Baptist Church. "Disley's St Mary's Church". Disley Parish. Archived from the original on 9 January 2016. "Disley Amalgamated Sports Club (The DASC)". Disley Amalgamated Sports Club. "Interactive Panoramic View of Higher Disley". High Peak Web Solutions. This page was last edited on 17 April 2019, at 12:23 (UTC).